I am honestly not quite sure how many blog posts I have about Thanksgiving. It’s probably about 1 per year for 8 years. I’m going to guess it’s 8. Here goes my internet search. This is what I found. What is the specific heat capacity of a turkey? Experimental evidence included. Could you cook a turkey by just dropping it? You know, heating from the change in gravitational potential energy on impact? How many batteries would it take to cook a turkey? Electrical cooking. Here is another way to cook a turkey by dropping it. Drop it from a lower height but multiple times. Note: the original title for my book Geek Physics (Amazon) was “Can you cook a turkey by dropping it?” True. The physics of a Macy’s Thanksgiving Parade balloon. Black Friday homework (and some other stuff). Yes, I know this is not Thanksgiving. Since this is just a normal plain blog, I can do silly things like this report on my recent trip. Why not? I was invited to give the keynote address as well as a workshop on python at the AAPT/APS section meeting at the University of Houston. Since this isn’t too far away, I decided to just drive there – it’s about a 5 hour trip. Not bad, plus I can bring as many pairs of shoes that can fit in my car. I brought one pair of shoes. I drove in on Friday and arrived Friday evening – I stayed at hotel on the outskirts of Houston. A note regarding section meetings. I really like section meetings. They are smaller, cheaper, and it’s easier to get around and see everyone. Oh, national meetings are cool too – but sometimes they are just too big. Also, who likes paying 500 dollars just for registration? Not me. For the workshop, I used my python material. This is essentially the same stuff I used at the Chicago Section of AAPT. Here are some notes. The material basically this stuff on trinket.io. I also have instructor materials and other files posted on the PICUP site. It seems there were about 15 participants. The room had computers for people to use – that helps out a bunch. There was an issue with the projector – it wasn’t quite working. Someone brought in a backup, but it wasn’t bright enough. It’s funny how small problems like this can make a big difference when people are learning. Another issue for python workshops – variety of people. Some people have never used python and some have experience. This makes it slightly difficult. Other than that, I think the workshop went well. I had one person ask me afterwards how to become an expert with python. My response was to just keep practicing. The best way to learn is to learn python to solve particular problems. It’s pretty tough if you try to learn stuff without a purpose. Oh, also – sloppy code is fine. Normally, I give a talk that focuses on physics of science fiction or video analysis or something like that. I’ve talked about science communication before – but in this case I wanted to include a bunch of examples from MacGyver and MythBusters – so I had to make a new talk. This is the “club level” of the University of Houston football stadium. No, there wasn’t a game going on at the time (but that would have been funny). It was a nice place – the screens were in a weird position, but still it was nice. Oh, I did make one fairly big mistake. I was having trouble with the projectors and I ended up with “mirroring” on my computer. This means that I didn’t see the next slide and and I didn’t have a clock. I really like seeing a clock. Build a bridge from the science to the audience (complicated, conceptual, or shiny physics). Science fiction is still fiction. Use mistakes as a foot in the door to talk about what you want. Overall, I think it went well. Oh, there was one great question at the end. “How do we use science communication to help people understand climate change?” My response: we need to focus on the nature of science and understanding of what exactly science is all about. Finally, here is another picture. This is me on the football field (which was kind of cool). This one is pretty awesome. MacGyver needs to lift up a truck to get it un-stuck. So, he takes a rubber bladder (not sure where he got it – it could be part of a shock) and connects it to the exhaust (or maybe he connects it to the liquid oxygen). Anyway, he fills the bladder with an expanding gas. The bladder fills up and lifts the truck. This would totally work. Check out this version you can do yourself. That might seem like a tiny area – but that would be a square about 9 cm on a side. So, this is clearly possible (as you can see in the video that I actually did it). We normally think of oxygen as a gas – and at room temperature it is indeed a gas. Actually, it’s a molecular gas of O2 – two oxygens bound together. I guess we should first talk about air and oxygen. Yes, we need air to breath – but air is more than just oxygen. It’s approximately 21 percent O2 and 79 percent nitrogen gas. If you decrease the temperature of oxygen gas – it will turn into a liquid. Yes, it has to be super cold at negative 183 C. How cold is this? Here is a video that shows how cold this is (and liquid nitrogen) along with some of the cool things you can do with super cold stuff. Humans can survive under very high pressures. However, there is a problem with breathing high pressure air. The nitrogen in high pressure air can be absorbed into your tissues and stuff. When the human then goes back to a lower pressure, this nitrogen comes out of the tissues. If the change in pressure happens too fast, this nitrogen can bubble and cause all sorts of problems. This is basically what we call decompression sickness. The other problem is oxygen. At 21 percent oxygen at normal atmospheric pressure, everything is fine for humans (since we live in this stuff). However, as the pressure increases, the partial pressure of oxygen also increases. At normal cases, the partial pressure of oxygen is 0.21 atm (atmospheres). If you have 50 percent O2 at atmospheric pressure, this would be 0.5 atm. The partial pressure is the current pressure multiplied by the fraction of gas. Here’s the deal. If the partial pressure of oxygen gets over 1.6 atm, bad stuff happens. Stuff like convulsions. Oxygen is bad stuff. How do you get a partial pressure of 1.6 atm? If you increase the pressure, the partial pressure of 21 percent O2 is 1.6 atm. OK, now back to the show. MacGyver can survive in high pressure one of two ways. Method number 1: don’t breath air. If he breathes a gas mixture that has a lower concentration of oxygen, This is what deep divers do when they breath mixed gasses like trimix. Method number 2: use a constant atmosphere suit so that he stays at 1 atm pressure. That’s what he does in this case. What happens if MacGyver pulls out his air hose? Yup. That would work. Even at super high pressures. Oh sure, his lungs would get super small because of the external pressure – but that’s just fine. This is exactly what happens when a free diver goes deep (breath holding). Oh, he would have to equalize his ears just like a free diver. This is real. You can make a simple version of this yourself. Or you could make a crazy huge version like this. MacGyver needs to get a thermal camera down from a balloon. The balloon (it’s not actually a weather balloon) is tethered down by multiple lines. So Mac uses the jumper cables from the car and connects them to the car battery. Then he connects ONE cable to the wire and the current causes the balloon to burst. OK, let’s step back for a moment. Remember that this is a show – this is not real life. I just want to make sure we are all on the same page there. So, there’s a small mistake here (you can blame me if you like). In order to get an electric current from the car battery to go through the balloon, you would need to make a complete circuit. One jumper cable connected to the line is a start, but there needs to be a path for the current to get back to the battery to make a complete circuit. One way you could get this to work is to take another line going to the balloon and connect the other jumper cable to that one. If you look close, it seems like the other cable isn’t connected to anything (in the show). Of course, that mistake is better than connecting both wires to the same line. This is sort of the same problem as this double spark in Iron Man 3. Yes. Thermal cameras are indeed real. Yes, the heat signature of an electric car would be different than an internal combustion engine car. Actually, I need to see how hot they get in real life (electric cars). I’m going to test this the next time I see a Tesla. Oh, and here is an overview of seeing stuff in infrared (also called “thermal image”). 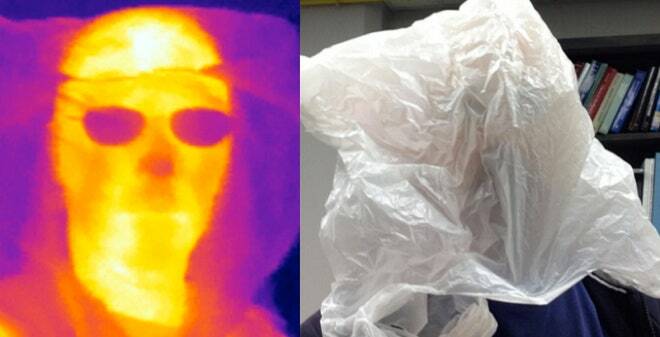 Just for fun, here is a visible and infrared image of me with a bag over my head. MacGyver needs to find the transparent explosive. One of the tools he needs for this is a source of x-rays. This seems to be real – but it appears you can make x-rays from a vacuum tube, a lighter (the long kind) and a diode. Here are the instructions from hackster.io (I need to build one of these). Uses a vacuum tube from an old radio. Historically, the vacuum tube was used where transistors are used now. These things are awesome. The lighter has a piezoelectric in it. When you apply a pressure to these devices, it produces a voltage – the voltage can get high enough to make a spark in air which lights the gas from the lighter. When you connect the piezoelectric to the vacuum tube, you can make a super high voltage inside the tube. This can accelerate electrons such that they crash into the other electrode. This crashing electrons is exactly how you create x-rays. X-rays are just like normal visible light except that they have super small wavelength. This can make them interact differently with matter. For instance, they can pass through some materials (like human skin). What is the x-ray used for in this hack? X-ray fluorescence. This is essentially the same as glow in the dark (kind of) material except get’s “activated” with x-rays instead of other visible light. Oh wait! I already have a video on x-ray fluorescence. One final note. In the show, MacGyver says something about shooting ions. That’s not really what happens here. X-rays are not ions. Hydrogen balloon from a trash bag. Can you fill a trash bag with hydrogen? Yes. Will it lift stuff? Yes. Could it lift a trash can? Maybe…just maybe. Here is my super short introduction to buoyancy. Suppose you take a box of air – the box is 1 meter on a side such that the volume of this air is 1 x 1 x 1 = 1 m3. Assuming there is no wind or breeze, this “box of air” will stay in the same location. Since the box is at rest, the total force acting on the air must be zero. OK, there is obviously a downward gravitational force on the air puling it down. Yes, air has weight. If something has mass, it has a gravitational interaction with the Earth. Everyone likes to think of air as being weightless – but that’s probably because it has a low density and it’s normally “floating”. But if there is a downward gravitational force on the air, there must be an upward force pushing to counteract the weight. This upward force is the buoyancy force. Since the box of air floats, we know the buoyancy force has to have the same magnitude of force as the weight of the air. Now let’s suppose I take away that “box of air” and replace it with a sealed cardboard box (it could be a box made out of anything, but in my mind it’s a cardboard box). The air around this box is going to interact with it in the same way as it did with the box of air (because air is dumb and doesn’t know any better). This means the cardboard box has the same buoyancy force as the box of air – it is equal to the gravitational weight of the air the box displaces – this is essentially Archimedes’ principle for floating stuff. Oh, this buoyancy force is still the same no matter if the object is floating or not – it just has to displace air. You can also do this with water or really any substance – like pudding. Not sure why you would float something in pudding. Finally, we are getting somewhere. Now you can calculate the size (solve for V) of a balloon needed to lift a trash can. If you want a simple estimate – you can ignore the mass of the hydrogen in the balloon (but it does indeed have both mass and weight just like the air). I’m leaving the rest of this as a homework assignment for you. I’m going to change up my posts on MacGyver hacks. I’m going to limit the focus on things that I can significantly talk about. So, suppose there is some hack involving a belt that loops around a pole and something happens. It might be a great “hack” – but if there’s no fun science to discuss, I will just skip it. Also, I’m not going over any of the chemical explosions. MacGyver does something to a radio to such that it creates a high pitched squeal – a type of sonic weapon. Is this plausible? Yes. Since a radio has both a microphone and a speaker, it’s possible to set up an audio feedback loop. Here is a short video showing this. Actually, this demo leads to some interesting questions. In particular, what does the feedback frequency depend on? I think that the frequency of the squeal depends on both the audio properties of the speaker AND the mic. If you change either one of these, the frequency should change. This would make a great science fair project. I’m way behind, but I figured it would be best to go over the new stuff while it’s still fresh. Don’t worry, I’m still going to do the old stuff. I don’t know how much stuff to go over at the beginning of the episode. Clearly MacGyver has been working hard in this village and there are all sorts of DIY stuff. Let’s just leave it at that. So, you need water from a well – right? That’s where a water pump comes into play. Let’s just talk about pumps in general. There are really two types of water pumps. There is a suction pump and a spinning pump. For the suction pump, air is removed from a tube above the water. This reduces the pressure on top of the water. There is still air pressure pushing on the rest of the water – and this air pressure (from the atmosphere) pushes the water up the tube. Once the column of water produces the same pressure as the atmosphere, the column of water stops rising. This means you can pump water up 33 feet. For the spinning pump (not its actual name), there is something that spins and pushes the water. Think of this as a water fan blade. The blade spins and pushes the water up the tube. Note: you can barely see this hack – it’s fast. But it’s there. Yes, you can make a spark with quartz rock and steel. The key thing is that the quartz is strong enough to chip off super tiny pieces of steel. These super tiny pieces are hot enough and small enough to react with the air and get super hot. You know what would be great for these posts? Images or gifs of the different hacks from the show. Maybe someday I can add those. For now, It’s just science and stuff. I don’t like to use the “barely plausible” tag – but let’s be honest. It’s going to be pretty difficult to redirect a heat seeking missile. I guess it’s not impossible though. A heat-seeking missile has an infrared receiver to look for “hot” objects. Usually, this hot object is the jet engine exhaust for an aircraft. So, for this hack, MacGyver wants to get the “attention” of this missile using a flood light. Yes, these things get hot – but not jet engine hot. Normally, a plain light would radiate energy in all directions. Imagine this light as an expanding sphere with a particular radius. Since the light must be even over the surface of this expanding sphere, the intensity of light decreases with distance. The area of a sphere is proportional to the square of the radius – so this is where we get the “inverse square law” for light. Of course the inverse square law means that a bright (and hot) flood light won’t do much if it is far away. One way to fix this is to use a parabolic dish to refocus the infrared light – a spot light. Yes, you can do this with a plain metal dish for infrared. So, in the end MacGyver has an infrared source he can focus on the heat-seeking missile and perhaps get its attention. MacGyver makes a type of taser (not really a taser) out of an electric shaver. The basic idea behind a taser is to shock a person with an electric current. There are two types of current – there is direct current (DC) like the stuff that comes out of a battery. This current just goes “one way” in a circuit. Shocking people with DC current is a little bit more complicated. The other current is alternating current (AC) in which the current constantly switches directions with some frequency. In the US, AC current is at a frequency of 60 Hz. Why does this matter? It matters because if it’s a plug-in type razor then you already have AC current and it’s easier to shock someone with AC. So, to make a plug-in razor taser you just need to take the main power lines coming into the razor and connect them to something on the front. When a human victim touches both of these wires, the human becomes part of the circuit and gets shocked. Don’t try that at home. If you don’t clean your gun, it probably won’t work. A toothpick in the move-y part will probably mess it up. Not a gun guy. Oh, I don’t think this would make the gun misfire – just jam. But you can see where the name of this episode comes from. So, MacGyver puts two smoke grenades in a jacket . Really, there’s not much to say here. In a classic MacGyver move – he uses his belt buckle as a weapon. MacGyver uses a train torpedo to attack a dude. Not much to say here. MacGyver uses a pipe to hold the stuff – magnesium shavings and iron oxide shavings. Boom – thermite. Thermite is a chemical reaction that gets SUPER hot. It’s actually pretty awesome but not easy to make. You need to get the metal into a very fine powder. But if you do that, here’s what happens. How do you stop a train? One way is to mess with the DC motors. Yes, most trains are diesel-electric. They have diesel engines that power electric motors. If it’s a DC electric motor, you can switch the polarity of the wires and the motor will rotate the opposite way. This might not stop the train right away – but it’s a start. Here is a demo you can try at home. Oh wait – I can’t find the video. Well, here’s what you do. Get a battery powered toy car with a motor (a cheap one). Switch the direction of the batteries and the car will drive backwards. I found the video. Here it is. Today it started with a lose bolt that holds down the toilet. Actually, the bolt was gone – beyond gone. Rusted away. I figured the flange thing that the bolts go into was probably busted too, but you can’t tell until you lift up the whole toilet. When starting a project like this, I always go to youtube first. What a lucky time to live in that we have a resource like this. Of course it wasn’t just the broken bolt. I needed to replace the wax seal too. As long as I’m working on the toilet, I should also replace that tank fill valve that was slightly leaking. Oh wait! When I turn off the water to the toilet with the shutoff valve, that is leaking too! After a trip to the hardware store and multiple rounds of turning off the water to the whole house, I finished the job. The seat doesn’t rock, the shutoff valve doesn’t leak, and the fill valve stops when fill. Oh, how about a quick advertisement for those quarter-turn shutoff valves? My house has these “multi-turn” valves that are like the kind on your outdoor water hose. I’ve already had two of these leak – so that’s not so good. Also, when the toilet overflows (it happens), the quarter turn is faster to shut off. I’m just going to say one other thing about toilets (this is not a toilet post). It seems like a pretty simple job – but once you get confined in space, everything gets just a little bit more complicated. OK, but in the end – it’s finished. In the end, I’m pretty happy. I feel like I accomplished something. I fixed something and made it better. I feel human. Why can’t they just make toilets that don’t break? For that matter, why not make a lawn that doesn’t need mowing. Oh, how about clothes that don’t need washing? All of this cleaning an fixing stuff is just taking away time from more important stuff. That was the old me. The new me doesn’t mind these chose so much. Oh, I still get bothered sometimes. When the lawn needs mowing and it’s super hot (or won’t stop raining) or when something breaks and you JUST KEEP MESSING UP. Yes, those times are frustrating. But I’ve come to accept that we live in a world that increases in entropy. If you leave stuff alone, it will just mess up and eventually break. What makes humans so awesome is that we can fight this tide of increasing disorder. We fix things. We clean things. We are humans. I like telling old stories – so I am just going to keep doing that. I wanted to share a particular story of an event while I was at CERN – but then I figured I should explain why I was at CERN first. So, here it goes. I was an undergraduate student at Benedictine University (we called it I.B.C. back then) with a major in physics. BTW – that was a great experience, I should write about it sometime. After graduating, really the only graduate program I was accepted into was at The University of Alabama (in 1992). After my first year, I started working with the Experimental High Energy Research group. I honestly have no reason to be in this field except that one of the physics faculty sort of invited me into the program – so I did. I clearly wasn’t theoretical physics material – so, what the heck. I figured that’s where I would go. The group originally worked with the Superconducting Super Collider (SSC). This was a giant particle accelerator being built in Texas. SPOILER ALERT: they soon canceled the program. Anyway, our group’s role was to build muon detectors. These are essentially super long Geiger tubes. In order to get precise muon track position, we needed a precise location of the wire in the middle of the tube. Since these were long tubes – the wire had a sag. It was that sag that we tried to determine. But the SSC was canceled. I think the program had some funds left over from the grant – so the faculty member in charge decided to collaborate with CERN. He had money to send me there to work the following summer. I think his main goal was to use up the money and have a student listed as “doing research” – that would look good for his tenure application. Yes, faculty do silly things like this. I didn’t really want to go to Switzerland. I know people travel to all sorts of crazy places when they were much younger than me, but I really didn’t do stuff like that. On top of that, I really didn’t know what my “mission” was at CERN other than to serve as a “checkbox” on a physics faculty tenure application. Oh well – I went anyway. Wait. What the heck is CERN? CERN (European Organization for Nuclear Research – the acronym works in French) is in Geneva Switzerland (mostly) and is a particle accelerator. So, essentially it is a giant underground ring that accelerates particles and then smashes them into other particles. There are some particle detectors spaced around the ring to – you know – detect stuff. Our group worked on the L3 detector. OK, so I move out to Switzerland for the summer. Maybe now would be a good time to point out that that part of Switzerland speaks French. I don’t speak French. However – I am fluent in pointing at stuff. Most people at the research facility spoke English – but food was in French. I just pointed. I didn’t starve to death. While I was there, my “job” (which was poorly defined at first) was to write and modify FORTRAN code to analyze detector alignment data. Basically, there are more than one detectors and you need to know the relative position of these things to track particles. We had two alignment systems – a laser alignment and a capacitive sensor. I was supposed to take data from these and then “do stuff”. I’m a pretty sucky FORTRAN programmer. I was then, and I still am now. It was great to be at CERN, but I mostly just worked in the computer lab messing things up. I really don’t know if I even accomplished one thing while I was there (research-wise). I did get to meet lots of new people and hang around CERN and see cool stuff. Overall, it was a great experience. More on my CERN adventures will be posted at some point. How much does one lego piece cost? Mass Volume and Density of a LEGO – with graphs. Also, price per mass. Variation in the size of a LEGO block compared to other blocks. How big would a LEGO Death Star for minifigs be? HUGE.